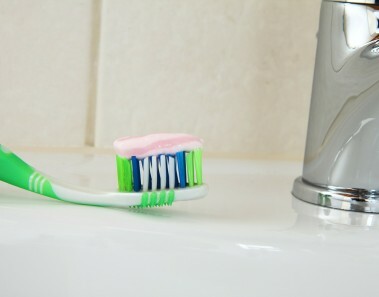 Are You Brushing Your Teeth with a Pesticide? We use antibacterial products thinking that we are protecting ourselves and our families from harmful germs. They sound great in theory – when we see a product that kills “99.95 of germs,” it sounds like it’s a good thing! Is it too good to be true? Most likely. 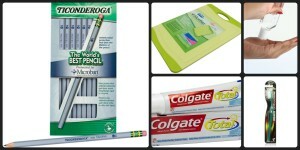 Most of these products contain a product called triclosan, and it is found in everything from deodorant, antibacterial soaps and handwash, dishwashing liquid, socks and clothing, cutting boards, and even toothpaste (Colgate brand). 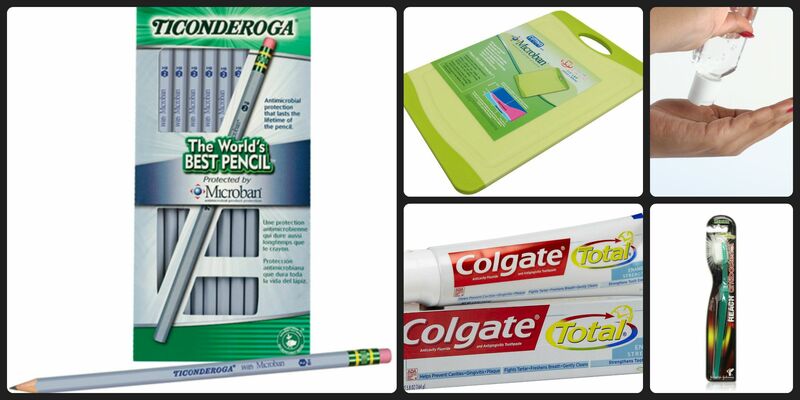 But did you know that triclosan was originally registered as a pesticide? Scary, especially when you realize how many times we may be exposed to it per day, and when we think of our children putting their fingers in their mouths after using a product containing it. The FDA has even recently decided to review the safety of it. Antibacterial products do have their place, especially in hospitals, but their widespread use may be contributing to health problems, as well as more illnesses that are resistant to the antibiotics used to treat them. Triclosan acts as an endocrine distruptor in the body. An endocrine disruptor is a man-made chemical or substance that interferes with the production or function of our body’s natural hormones. The endocrine system regulates every function of the body. Endocrine disruptors are also stored in the body’s fatty tissue and do not get flushed out with water, meaning that they can keep accumulating inside they body. For example, estrogen is an example of a messenger hormone, and many chemicals that act as endocrine disruptors can mimic it. The rise in breast cancer, non-Hodgkins lymphoma, and thyroid cancer have been linked to exposure to environmental estrogens. Thyroid cancer rates have increased more than 45% in the U.S. alone (endocrine disruptors may also affect thyroid hormones). More women are affected than men (women use more personal care products) and has become the #1 cancer in children under the age of twenty. Exposure to triclosan can begin at birth; it has been found in 3 out of 5 samples of human breast milk. And the Center for Children’s Health & Environment at Mt. Sinai School of Medicine in NYC has stated that endocrine disruptors are suspected of “contributing to reproductive and developmental disorders, learning problems, and immune system dysfunction.” Reproductive disorders can lead to issues such as fertility issues, and to reproductive and breast cancers. Because triclosan may also play a role in altering the immune system, a 2012 study found that children who had the highest levels of triclosan in their urine had TWICE the risk for food allergies, hay fever, and food sensitivities, compared to those who had the lowest. Research has shown that endocrine disruptors, such as triclosan are “capable of producing immune system imbalances, which can lead to allergies, among other health issues,” and they may actually increase the production of cells in the body that lead to allergies. 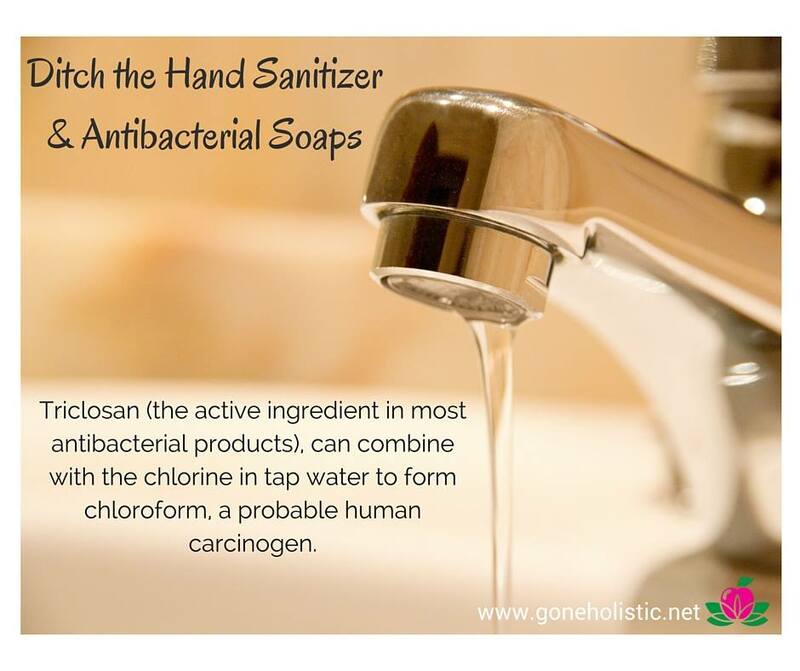 Triclosan has also been found to react with chlorine in tap water to form chloroform, a probable human carcinogen. Researchers at Virginia Polytech University studied triclosan using products such as soap and dishwashing products and found that the combination produced chloroform levels that met or exceeded the EPA’s allowable amount. This is also a huge problem because we brush our teeth and wash our hands with tap water, and if those products contain triclosan, we may be inhaling chloroform vapors without even knowing it. Not only is chloroform a probably carcinogen, it is also linked to human bladder cancers and miscarriages. The CDC states on its “Occupational Health Guidelines for Chloroform” that exposure to chloroform vapors can result in kidney and liver damage. Manufacturers of triclosan-containing products claim that it can continue to work as long as 12 hours after use, so that means that exposure continues much longer than the time it takes to wash your hands or brush your teeth. In addition to reports of skin irrtitation with use, immune and nervous system reactions have been reported. Another problem is that it can contribute to antibiotic-resistant “superbugs.” Triclosan was originally used as a surgical scrub and in hospitals to prevent infections, but there is no data that exists to show effectiveness when used in products found in a normal household. There is also evidence that suggests that the use of these antibacterial products kills off normal bacteria, while leaving tougher bacteria behind. A big fear is not only resistant bacteria, but also bacteria that lives longer. If you would like to avoid triclosan, be sure to check your ingredient labels, and avoid products labeled as “antibacterial” and “antimicrobial,” or have the brand name “Microban.” You may also see it listed under BioFresh, Irgasan, Lexol 300, Ster-Zac, and Cloxifenolum. Also look for a hand sanitizer that does not contain triclosan or other undesirable ingredients, such as alcohol.